What does MMS actually do to help you recover your health? This may come as a surprise to some, but the only thing that MMS does for you is kill disease germs of all kinds and neutralize poisons—nothing else. Technically, MMS in itself doesn’t “bring back your health”, it does not make you any stronger or healthier. It simply kills disease germs and destroys (oxidizes) poisons. From that point on MMS can do nothing. But the good news is, that’s enough, because once the disease and poisons are gone what the body can do from there is amazing. Once MMS does its thing, the body can heal. This is important and something that you must be fully aware of, and that is MMS kills diseases of all kinds through the process of oxidation. Both MMS1 and MMS2 are oxidizers that destroy poisons and disease pathogens in the human body, and then the body is able to heal itself. MMS does not cure or even supply nutrients for healing. It is up to your body to restore health once the disease is gone. And the body does do that, but you also need to give your body proper nutrition for good health. MMS is a great first step, but then I highly suggest you take time out to examine things such as your diet and lifestyle. Are you eating right and getting proper nutrition, exercising right, resting and de-stressing enough? Are you living right? Suffice it to say, if I were sick, MMS would be the first step I’d take on the road to recover health. MMS is the first line of defense! It packs a wallop to disease pathogens and poisons and it sets the stage so you can get your health back, and/or stay healthy. Time and again over the past 22 years, in more than 90% of cases, when MMS has been used correctly (note: emphasis here on “used correctly”) the human body recovers from the diseases of mankind. ⮞ I have said it time and again, but I’ll say it once more, considering the condition of our world just about everyone could afford to focus some attention on their own health. Today, everyone needs some kind of protection from the many poisons and toxins that are all around us and other various attacks against our health. This is why I say, MMS is an excellent first line of defense to get healthy if you already have a particular health condition. 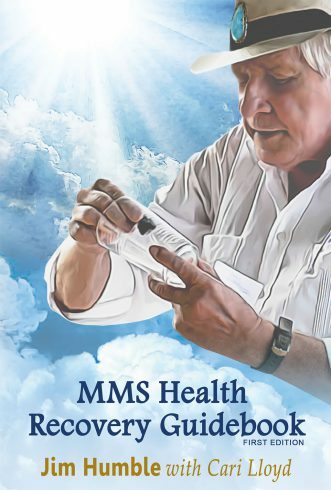 And once you are healthy to help you to stay healthy and maintain good health I suggest a single dose of MMS daily (MMS Maintenance Dose) in order to help you detoxify on a daily basis, and to keep you well overall.